Creating a top ten list for books on Alexander the Great is not easy, since few ancient historical figures have been written about as much. Everything from his complex personality and his sexual life to his military and logistical tactics have been analyzed by historians. Alexander, simply put, stands out as unique among ancient historical figures for having so much detailed assessment made on his life and times. Although few primary sources exist from the time of Alexander, we know a lot about him from late Antiquity sources. His military campaigns are still studied in places such as West Point and other military schools around the world (e.g., see Engels 2007 volume used in military colleges). Briant's book, which has been translated (see Briant 2010 in the list) is perhaps one of the best, as it shows Alexander's influences and how he fashioned his new empire not so much on the Greek model but more as an Achaemenid king. Freeman's 2010 volume though is one of the most popular. It promises to be an easy read and that is what it exactly is. So here is the list for the top ten books on Alexander the Great. Keep in mind there is no particular order for the greatest to least great among these books. Naiden, F.S. Soldier, Priest, and God: A Life of Alexander the Great. Oxford, Oxford Univesity Press. Most accounts of Alexander the Great essentially ignored the reality that he was, in addition to soldier and leader, he was also a religious figure. As information of Alexander's campaign in the Near East has come to light over the past 30 years, the religious aspects of his conquests have become clearer. Naiden's work fundamentally shifts the narrative of Alexander's life as a soldier, priest and even god. Heckel, W., & Tritle, L. A. (Eds.). (2009). Alexander the Great: A New History. Chichester, U.K. ; Malden, Mass: Wiley-Blackwell. This work is a relatively recent revaluation of the popular themes regarding Alexander. This includes his sexuality, military style, and influences. Cartledge, Paul (2004). Alexander the Great (1st ed). (Overlook Press, 2004) Paul Cartledge is one of the foremost experts on Ancient Greece. His book focuses on Alexander's ambition and his military campaigns. Freeman, Philip. (2011). Alexander the Great. New York: Simon & Schuster. Considered today to be the easy reading and more captivating historical presentation on one of history's great figures. Freeman uses his strong presentation skills to grip the audience to know more about Alexander. Arrian, Mensch, P., & Romm, J. S. (2010). The Landmark Arrian: The Campaigns of Alexander. Anabasis Alexandrous: a new translation (1st ed). New York: Pantheon Books. One of the battlefield books. This exposes in detail the 12 odd years of campaigning that Alexander took to conquer much of the known world. Briant, Pierre (2010). Alexander the Great and his Empire: A Short Introduction. Princeton: Princeton University Press. One of the best books out there. It looks at the complex influences and history. More than the West dominating the East, Briant shows Alexander learned much from his enemies and that changed the world. Romm, James S. (2011). Ghost on the Throne: The Death of Alexander the Great and the war for Crown and Empire. New York: Alfred A. Knopf. We think of Alexander's life as nothing short of amazing. However, his death plunged his empire into chaos and out of the dust new kingdoms emerged. In many respects, it is the death of Alexander that also changed the world and this book explains how. Martin, T. R., & Blackwell, C. W. (2013). Alexander the Great: The Story of an Ancient Life. Cambridge: Cambridge University Press. Another book that looks at the complexities of Alexander and the totality of his humanity, from warrior to deep thinker. Lane Fox, R. (2005). Alexander the Great. London: Penguin. This is written in a more novel style, very much like Freeman's later work. Again, a relatively easy read. Randall, B. (2004). Alexander the Great: Macedonian King and Conqueror (1st ed). New York: Rosen Pub. Group. 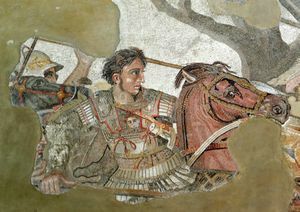 A more classical presentation that looks at Alexander's background, his upbringing, and how these influence him as he sets about on his campaigns. Engels, D. W. (2007). Alexander the Great and the Logistics of the Macedonian Army (Nachdr.). Berkeley, Calif.: Univ. of California Press. This is a great book for those interested in military warfare. An army wins through its stomach and supplies and this book explains how Alexander conquered this unseen enemy. Why was Epicurus and his philosophy so important? This page was last edited on 21 January 2019, at 13:06.